Women are not lag behind than their male counterparts in most of the sporting events. Moreover, women sections in sporting events like Tennis, Hockey ect are as popular as its male sections. Recently, football is also getting popularity among the women and there are some great women footballers to be the idol for young grills. I found some of those footballers who made this event more popular by their performances. If anyone of you thinks something to have included then please feel free to drop your comment in the comment section. Mia Hamm is considered the greatest player of the history of women’s football. She was born in 1972 in USA. She holds the record of scoring highest international goal for both man and women with her 158 international goals. She is in the second position in terms of highest international appearance with hr 276 international caps with USA after her fellow team mate Kristine Lilly. She won two world cup championships with USA. 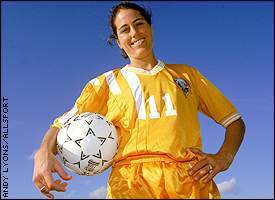 Hamm became the youngest ever player for USA to win a world cup in 1991 when she was 19. She also won two Olympic gold medals for her country. She took retirement form football in 2004 after playing a friendly match against Mexico where her two goals helped her team to win a 5-0 victory over their neighboring country. She became Fifa World Player of the year for twice in 2001 and 2002. This great footballer has been included in the list of 125 greatest living soccer player selected by Pele. Prinz is currently the leading footballer of the women’s football. She plays for German national women’s football team. She has been awarded as the Fifa World Footballer of the Year for consecutive three times from 2003-2005 which is also a unique achievement in the women’s football. 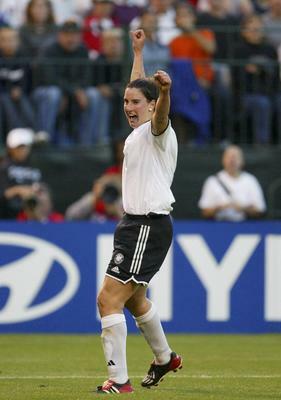 She has been receiving the award of “Women’s Footballer of the Year” inGermany from 2001 to still now. She has been the first women footballer to have been offered to play in the men’s professional league and in 2006 she also got an offer to join with the Real Madrid women’s football team. She won the bronze medal with Germany in the 2004Athens Olympic. This center forward won world cup in 2003 with her country and she scored 7 goals in the tournaments. Lilly is the longest plying footballer for both men and wo0men in terms of appearance. She ahs already played 310 international matches of her country. She has already been the highest goal scorer for her country with 112 international goals. She has been playing forUSA since 1887. She won two world cups and two Olympic gold medals with her country. She played for Boston Breakers in her club career and now is playing for KIF Orebro in Sweden. White is one of the famous footballers of women’s football at present. She is the caption of both Arsenal and English Women’s national Team. White started playing with Arsenal in her club career in1996/97 season. In the debut season she could win FA Women’s Premier League. Next season was very successful for this defender as she was named the National Premier League Player of the Year. In 1998 she got the chance for the first time to play for theEngland national women’s football team against France. She has already won six FA Premier Leagues, five women’s cup and five league cups. She first played as the captain ofEngland in 2002 against Nigeria. Foudy is one of the greatest women footballers. She played 271 international matches for USAand she won two world cups and two gold medals for her country in Olympic. She started her international career in 1887 and took retirement in 2004. She was one of the pioneers of the golden era of women’s football. She was also the President of the Women’s Sports Foundation.